DAYTONA BEACH, Fla. – This Sunday afternoon’s Advance Auto Parts Clash at Daytona International Speedway (3 p.m. ET on FS1, MRN and SiriusXM NASCAR Radio) features a group of 20 drivers with vastly different experience levels in the 75-lap exhibition event – but all highly motivated to make this first race of Daytona Speedweeks a statement-maker leading into the Feb. 17 season-opening Daytona 500. There are only two multi-time Clash winners in the field – three-time champs Denny Hamlin and Kevin Harvick. 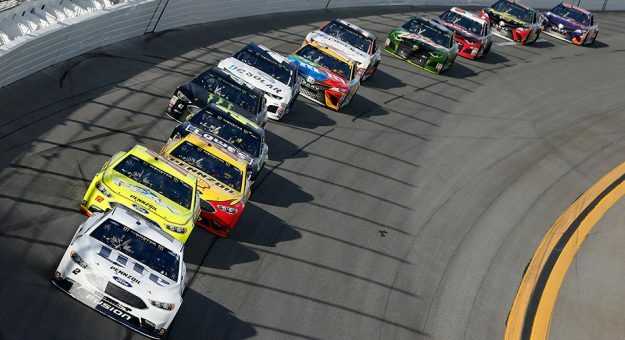 Only seven of the 20 have ever won the race before. Former Cup champion Brad Keselowski earned his first Clash win last year leading his Team Penske teammate – and the reigning Monster Energy NASCAR Cup Series champion — Joey Logano across the line in the thrilling traditional first taste of Cup racing action. Hamlin is unique in that he took to this race quickly. And often. He remains the only driver to ever win the Clash (2006) as a rookie. He answered with victories in 2014 and 2016 and his 142 laps led total is most among anyone competing this weekend – proving Hamlin both a quick learner and a perennial favorite when it comes to this sprint race. As for Hamlin, he is eager to quickly regain his footing as a perennial Cup winner. He did not win in 2018 – the first season in his 13-year full-time career without a victory. The Clash provides a high-energy opportunity to do just that. And Hamlin – the 2016 Daytona 500 winner — certainly will be considered a favorite in any event at Daytona International Speedway during the next two weeks. Its field is comprised of drivers who won a Busch Pole Award in 2018, are former Clash winners who also competed full time last season, former Daytona 500 winners who competed full time last season and all the drivers who qualified for the 2018 Monster Energy Series Playoffs. It was a good debut for Blaney last year, running competitively with his 1-2 finishing Team Penske teammates for much of the event and ultimately finishing fourth – best among the 2018 first-time “Clashers.” Jones was eighth. Bowman made his only start in 2017 finishing third and Suarez returns to the Clash field after an eighth-place finish in 2017. Joining Hamlin, Harvick, Blaney, Keselowski, Logano, Jones and Suarez this weekend will be Aric Almirola, who is coming off a career-best fifth place in the 2018 championship standings. Clint Bowyer, a two-race winner in 2018, Kurt Busch and his younger brother, last year’s eight-time race winner Kyle Busch ,will also be on the grid. Defending Daytona 500 winner Austin Dillon, the sport’s Most Popular Driver Chase Elliott — who picked up his first three career Cup wins last year — seven-time champion Jimmie Johnson, Kyle Larson, Jamie McMurray, Paul Menard, Ryan Newman, and 2017 Cup champion Martin Truex Jr. fill out the starting lineup. Interestingly, the Clash winner has gone on to win the Daytona 500 the following week only six times. Hamlin was the last to do it in 2016 and is the only active driver with that distinction.